This article was written by Kristie Batten, published in the Mining News. At board level, Fortescue Metals Group continues to set an example for corporate Australia, with over half of its directors being female. CEO Elizabeth Gaines said the company had seen its female participation in the December half increase to 18%, including 24% in senior management positions. “In my view, women in leadership positions are critical to ensuring we have a pipeline of talent for c-suite positions in corporate Australia, so that we continue to see improvements in diversity across our country,” she said. “Nationally, female participation in the trades servicing the mining industry is only 1% and at Fortescue we are committed to supporting women who are ready to pursue a career in the trades,” she said. “We have a bias towards high performance – that doesn’t sound like gender discrimination to me,” he said. “Without focus and accountability, targets are nothing more than a branding exercise to attract women to companies that will fail to uphold their promises,” Harrier CEO Kelly Quirk said. South32 CEO Graham Kerr was recently appointed as chairman of CEOS for Gender Equity and the organisation recently moved into South32’s Perth headquarters after being offered office space. South32’s progress on diversity goes beyond that, but is yet to be reflected in the statistics below. The company recently appointed Karen Wood as chairman as of next month, and on May 1, Katie Tovich will become chief financial officer. “The question I would ask is, why is that the case?” Vassie said last month. The stats are imperfect. Some are as of June 30, some as of December 31 and others are as of now. An N/A means the company either didn’t respond or provide the requested information. There are also inconsistencies in what is classed as a senior manager. Companies with operations overseas – Orocobre, Resolute Mining and Syrah Resources – were quick to point out that lowered their overall figures with many companies having a lower level of female workers due to cultural reasons. Technically, Alumina had the highest total female employees, though as largely an investment company, it has just 11 employees. It does not include the company’s interest in the Alcoa Worldwide Alumina and Chemicals. Alcoa of Australia is the only other miner to have WGEA Employer of Choice accreditation. “I firmly believe we are all accountable to make a difference and it’s everyone’s job to build a culture of equality, encourage diversity and enact positive change in our workplace,” Alcoa of Australia chairman and MD Michael Parker said. 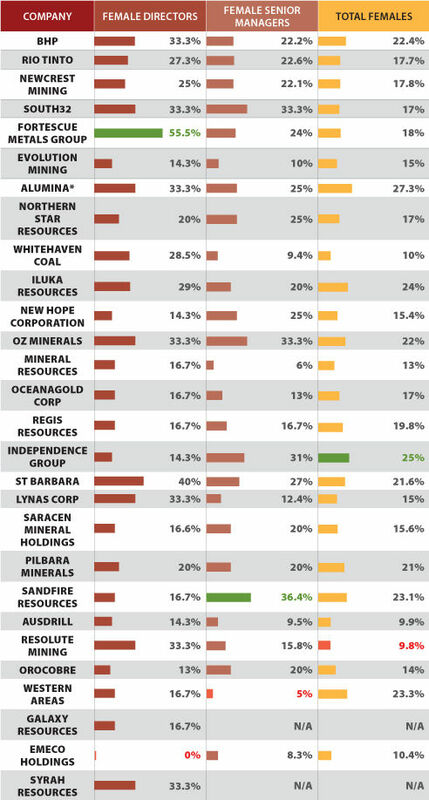 Evolution Mining’s percentage of senior managers was at the lower end and executive chairman Jake Klein said the company recognised female participation was low and needed to increase. “The proportion of women in Evolution’s workforce is improving and we’re always looking for further ways to attract the most talented people into our business,” he said. This article was written by Kristie Batten, and published in the Mining News. You can read the original article here, and you can subscribe to Kristie’s RSS here.